Front row L to R Latricia Dewerling, Deston Reddick, Cecilia Church-Store Manager, center w/scissors is new owner Susan Sullivan, Madeline Smith and Blair Travis with City of Calvert City. They are joined by several fellow Chamber members. Unavailable for photo was owner Mark Sullivan. 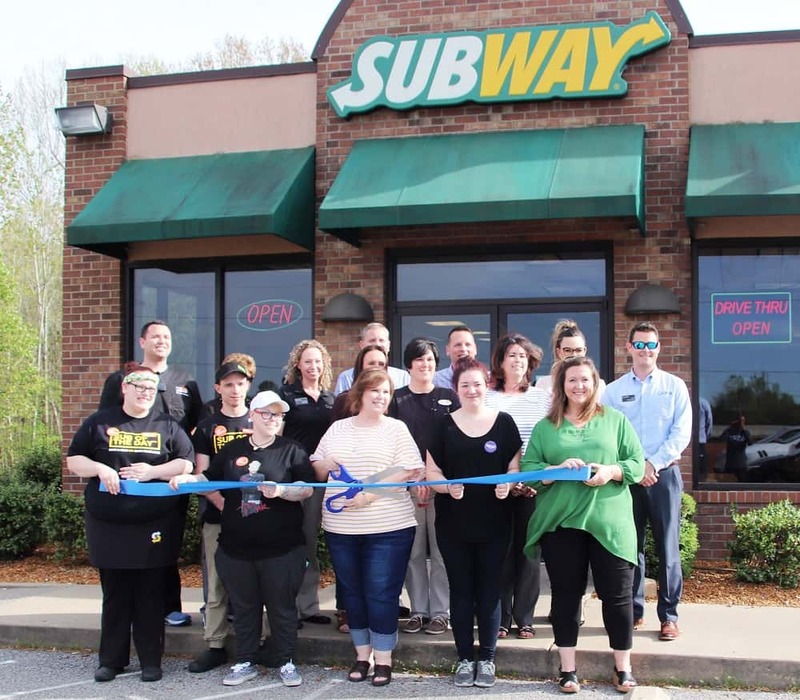 The Kentucky Lake Chamber of Commerce in Marshall County was proud to conduct a Ribbon Cutting for the Subway in Calvert City, the newest member of their organization. New owners Susan and Mark Sullivan believe Calvert City is an area that has growth opportunities and still has a “small-town feel.” The Sullivan’s felt the local Subway would benefit from local ownership and they take pride in being a part of the community by providing a fresh, healthy restaurant option. “We had eaten at Subway in Calvert City numerous times over the years as we traveled to Kentucky Lake.” When it became available for purchase, they jumped at the chance! Mark and Susan would like to give a shout out to their manager, Ceci Church and assistant manager, Maddie Smith. Ceci, Maddie and the awesome staff have been working diligently to make Calvert City Subway a great place to eat, so be sure and get by there to check it out. This Subway is located at 2911 U.S. Highway 62 in Calvert City, just off Exit 27. Their hours are 9:00 am to 10:00 pm Monday thru Saturday and 9:00 am to 9:00 pm on Sundays. They can be contacted directly by calling 270-395-7827 or order online or use Subway app to skip the lines.